They produce many types of confectionery: Hard and soft candy, jellies, licorice and… of course, gum! They focus on kids products, around the concept of fun. They also stress the fact that many of their products are Gluten free. Within the gum segment they are experts in balls (hollow or filled), melons, bottles and other round shapes. JAKE has also lollipop filled with gum. Some of the brands are FRUTI SPLASH (liquid filled balls presented in individual flow pack), SUPER GUM (lollipop with gum), BLUE/RED/GREEN EXPLOSION (filled balls which paint the tongue with color). 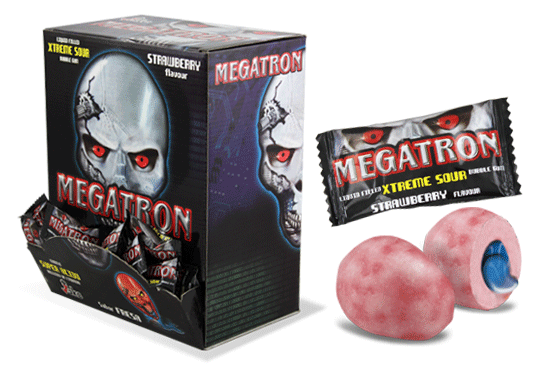 The novelty of this last ISM was the brand MEGATRON which includes both a lollipop and a super sour ball presented in individual flow pack. I thank Mr Antonio López for his time and explanations during ISM.